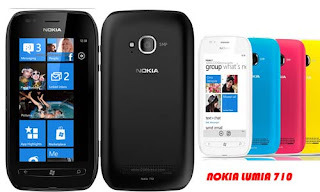 Mobile Phone - Nokia again compete with the series Lumia 710 Windows 7 operating system that is ripe for class smartphone market share of mid-End. 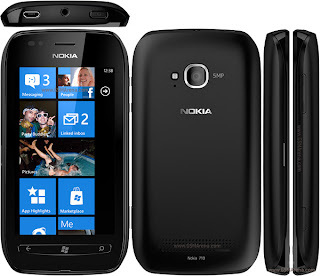 Characterizes the nokia itself does not change the skin at the Metro with a good level of responsiveness to be different from the other windows phone 7. Nokia has the right to alter and create your own skin because it already holds a license from Microsoft. 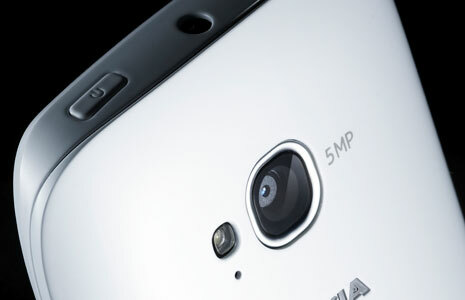 With a 1.4 GHz processor speed and the Scorpion Adreno 205 GPU used on the Qualcom Snapdragon system on chip making access MSM8255T smoothly. The internal memory capacity of 512MB of RAM and 8GB NAND Flash and the absence of micro SD slot that can be added to this smartphone. Type of display used capacitive and very responsive and can be tried while navigating the existing Metro. Gorilla Glass display used with a resolution of 800 X480 and 3.7-inch screen size is quite big and good in view while reading the writing on the web are explored. 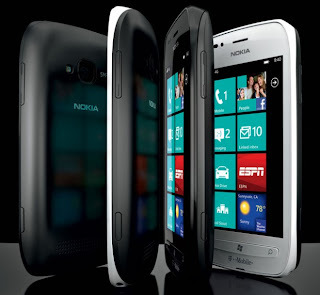 OS Windows Phone 7 includes new and existing on this pernagkat not necessarily exist in other devices. Windows Update can be done periodically in the coming into force of the Microsoft Zune with how to run the application, but before Lumia first plug 710 on the PC and will automatically update with the bugs that already exist. 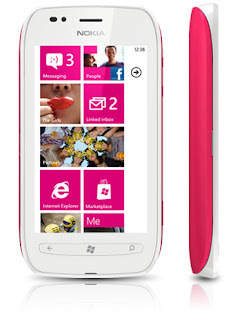 Metro is a Windos design of your phone and you can find skin-shaped screen interactive boxes with the name of Live Tiles. And can be changed as desired position of the wearer. How to find a list of existing applications by pressing soft button arrow located on the upper right or left sliding screen. Add the application to be on the tile at the start to appear on the screen as you want by way of pin. Lumia 710 Keyboard is very good speed when typing. Audio hole, the power switch and a micro USB slot on the top. While the camera and volume buttons on the right. The main camera used 5MP resolution with LED flash so that extra time in taking pictures in low light is very helpful at san unfortunately there is no front camera that can be used for video call with your friend or relative. 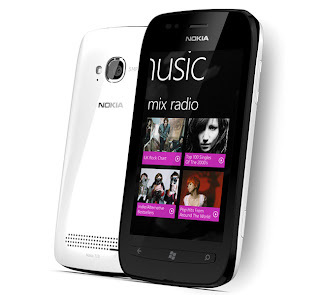 Multimedia is played fairly well and supports the standard default windows phone 7: WMA, WAV, AAC, and MP3. And FM Radio is another additional facilities are provided. Type of battery used BP-3L Lithium Polymer 1300mAh capacity and is able to survive 3 hours 7 minutes. Software lumia nokia 710 has been provided in the application menu: ESPN, Daily Social, Market Place, Tune IN, Planetix, Microsoft Office and Nokia Driver. If you are still not able to add the desired fit. 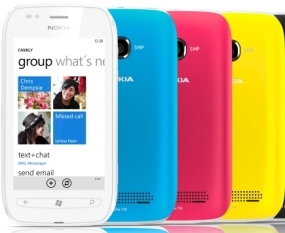 OS Windows Phone 7 is the first step of nokia to jump back in the smartphone market. 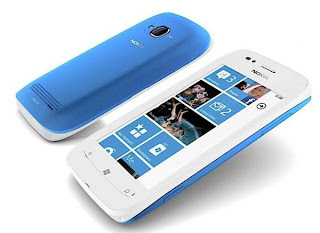 The latest OS in use at the Lumia series has several advantages in the offer and access to high-speed processors are supported mainstay nokia smartphone. Type: Li-Ion 1300 mAh "BP-3L"
Talk Time: Up to 6 h 50 min "2G" / Up to 7 h 40 min "3G"
Standby: Up to 400 h "2G" / Up to 400 h "3G"
CPU: MSM8255 Qualcomm Snapdragon processor, 1.4 GHz Scorpion,proximity,compass,accelerometer,Adreno 205.